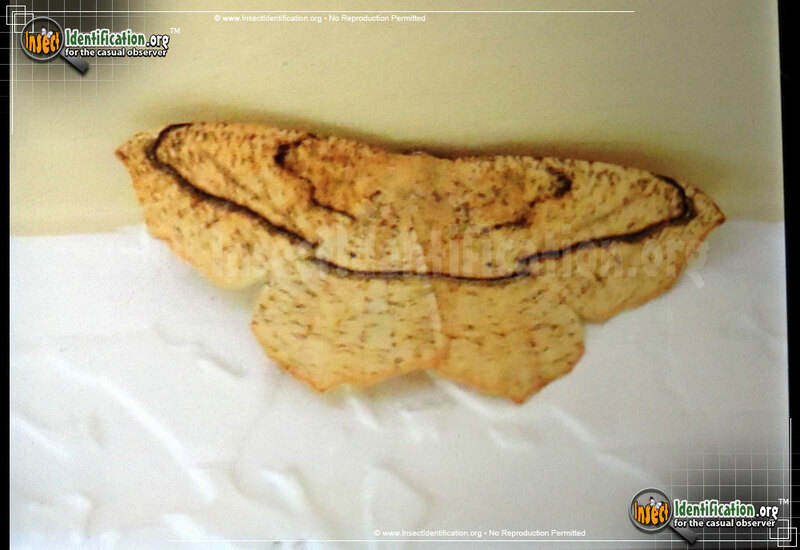 Detailing the physical features, habits, territorial reach and other identifying qualities of the Large Maple Spanworm Moth. Variation between individual Large Maple Spanworm Moths makes it possible to think several different moths are hanging out. Some Large Maple Spanworm Moths are yellow, while others are brown, dark brown, and even shades of deep purple. Some have a thin line that transverses its forewings and abdomen. Others have dark markings resembling a set of parentheses near the head. Many have a small black dot on the upper half of each hindwing. What seems like a lot of differences already is compounded in that still others lack all of that. This species is nocturnal and is attracted to lights at night. The caterpillar is brown and thin, resembling a twig. It raises one end of its body and stretches outward as if a part of a new branch on a tree. This position offers some protection form predators like birds and bats, who overlook the caterpillar as part of the tree. These young Large Maple Spanworms feed on a variety of trees, including maple, apple, oak, cherry, willow, and poplar. Smaller plants like geraniums, grasses, and sweet fern are also good host plants. This diverse diet means that adults can be found in a variety of places including hardwood forests, parks, gardens, patios, meadows and orchards. They are active from spring through summer and are common in their vast range.